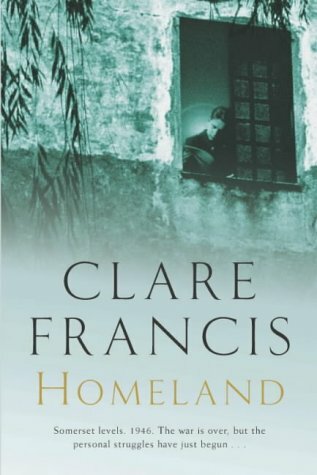 No, not the American TV series about Carrie Mathison and Nicholas Brody, the thriller by British author Clare Francis. Francis is a proficient thriller writer, but it is some years since I last read one of her books: until I picked one at random off my shelf one day. Homeland is set after World War Two in the quiet rural corner of England that is the Somerset Levels. A land of rising and ebbing water levels, and unworldly place of withies and willows. Into this walks Billy Greer on his return from the war, going back to the house of his uncle and aunt where he spent the difficult teenage years before the war. There, he finds the house and farm in disarray, his uncle dramatically aged, and his aunt upstairs confined to bed after a stroke. And he meets again the woman who made his spine tingle when they were both teenagers. Will he stay to rebuild the farm, or will he go to the promised job in London. And what of Annie, the local girl he could not forget while he fought his way around Europe? Underlying the telling of Billy’s story is that of the Polish soldiers, in a holding camp while they await either return to Poland or settlement in the UK. It is a difficult decision: their beloved country is unrecognizable and run by the Soviet Union, but they do not feel 100% welcome in England. Wladyslaw, a literature student who left university to join the Polish army, is an intellectual and a dreamer. But he takes a job working for Billy Greer, helping to set the rundown farm to rights. And there he meets local schoolteacher Stella who agrees to give him English lessons. This feels like a quiet tale – and it is not a thriller in the ‘spy story’ definition – but it is a story which kept me turning the pages. There are many uncertainties: the future of the Poles, the various love triangles, locals and immigrants living alongside each other without a common language with inevitable arguments and misunderstandings. The denouement is not what I expected. Having loved this, I now want to re-read Clare Francis’ other books. It is some time she has written anything, there’s a sad story about how she suffered an extreme form of writer’s block. To read more, click here. Ha! Bingo. Just last night at my film club we watched “Once My Mother” which you can read about more in the following link. Amongst many other poignant things, it follows the life of a Polish woman sent to “Siberia” and then forced to trek thousands of miles with other Poles to asssemble as part of the allied war support, then at the end, their homeland is handed to Stalin and they become refugees. The woman in this documentary became a refugee in Rhodesia for four years before being resettled in Australia. Correct. I was there for a short time when it was communist, and went back again two years ago. Such a cultured nation suffered terribly under the regime and people scattered all over after the war. My best girlfriend’s husband was born in a refugee camp after his Polish mother had been released from the German farm she had been forcibly sent to during the war (free labour). He maintains that he can still remember being hungry in the camp, even though he was only around three when they got to Australia. When I lived in Adelaide in the early 70s, I was regularly a part of the large Polish community who lived there. (and loved dancing the polka at the Dom Polski).